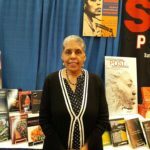 Barbara Smith is an American lesbian feminist and socialist who has played a significant role in building and sustaining Black Feminism in the United States. Since the early 1970’s, she has been active as a critic, teacher, lecturer, author, scholar, and publisher of Black feminist thought. She has also taught at numerous colleges and universities over the last 25 years. Smith’s essays, reviews, articles, short stories and literary criticism have appeared in a range of publications, including The New York Times Book Review, The Black Scholar, Ms., Gay Community News, The Guardian, The Village Voice, Conditions and The Nation. Barbara has a twin sister, Beverly Smith, who is also a lesbian feminist activist and writer. "Trust is to human relationships what faith is to gospel living. It is the beginning place, the foundation upon which more can be built. Where trust is, love can flourish."